I know not every writer is a recluse, spending countless hours indoors writing their manuscript, shunning the outside world. However, being a writer has kind of led to that, at least in my case. I posted recently about the huge heap of work I've piled on top of myself, so I have nothing to blame but myself. Still, writing is a solitary endeavor, and no amount of reaching out and being social will churn out pages of a manuscript. The biggest adjustment for me was embracing social media. Even though I've learned to interact with other writers and people I haven't met in real life through the internet, I still have trouble reaching out. For the most part, I'm still waiting for people to reach out to me. Putting myself out there was hard, but initiating contact with someone new is even harder. In the end, this is just one of the things I need to grit my teeth and just do. Once I force myself to initiate interactions with others a few times, it will get easier until it becomes a habit. Hopefully at some point, I may even enjoy seeking out connections. Maybe. But I'm not there yet. There's another aspect of being social which I find a little more palatable, and that's meeting new people in person. Don't get me wrong, I was pretty anxious before attending my first write-in, after which I was convinced I would never make any writer friends. But once I was comfortable (and finished my word quota for the day), I opened up with the writers around me. Of course, the write-ins I'm referencing were a part of NaNoWriMo and ended at the end of November. I was fortunate to find a local writers group through MeetUp and will be attending my first meeting next week. Currently, I'm a little nervous, but once I've done my critique for the other writers who will be presenting their work, I'll at least feel prepared. 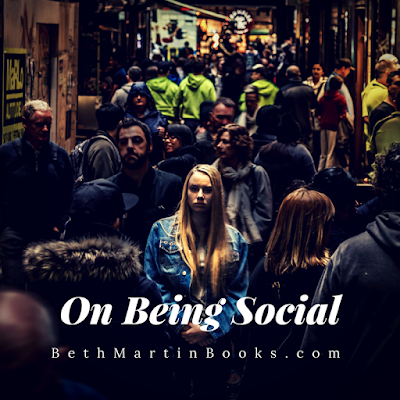 There's a completely different type of sociability that I'm practiced enough in enough to actually enjoy, and that's sales. I've applied to table at a few conventions/festivals (and am still anxiously waiting to hear back) and look forward to presenting my book to people and hopefully selling a bunch of copies. Plus, gatherings like this are always set up to be a lot of fun and filled with excited and interesting individuals. Being social as a writer is so beneficial, it's something I want to keep working at. Just from the little I've done so far, I've learned so much about myself and my craft. Other writers are a wealth of knowledge and can share a different perspective. Hiding in my little writing nook all the time would only be a hindrance to my growth as a writer and indie author. Are you ready to be social? Drop me an email or tag me on twitter.